Making crockpot apple butter is a great way to use apples you've grown or bought in bulk during apple season. Imperfect-looking apples make perfectly delicious apple butter and you may be able to pick them up for less from vendors who are making culls. In fact, using a variety of apples will give your apple butter the best flavor. Apple butter is thicker than applesauce and it is spiced. You will be evaporating water from it as it cooks, concentrating the flavor and thickening the consistency. It can be used like jam on toast for breakfast. 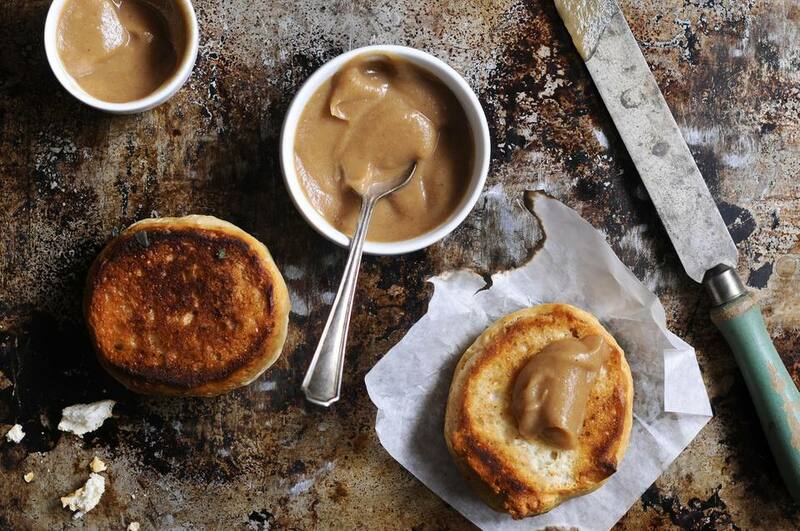 You can also use apple butter as a condiment with pork or a secret ingredient for gourmet grilled cheese sandwiches. Apple butter requires quite a bit of time for cooking down the apples, which makes your slow cooker a good tool for the job. You will need a crockpot that is 4 quarts or larger. If you have a bigger crockpot and lots of apples, this recipe doubles and triples beautifully. Begin by peeling, coring, and slicing the apples. Put the apples, sugar, and spices in a crockpot. Cover and cook on high for one hour. After an hour, remove the lid and cook on low (stirring occasionally), until the apple butter reaches a spreadable consistency and is dark brown in color. The cook time will vary depending on the type of apple you use. Softer apples will cook down better. Moister apples will take more time while drier apples will take less time. You can speed up the process by keeping your crockpot on high and stirring more frequently so your apples don't burn. Transfer the finished apple butter to hot, sterilized jars if you are going to can it, taking care not to fill past the headspace line. If you do not want to can it, place the apple butter in a sealed container and refrigerate or freeze it. You can enjoy your apple butter for up to 10 days refrigerated. It should retain its best quality for six months to a year in the freezer. If you prefer to make your apple butter on the stove, that is easy to do instead of using a crockpot. Just set your pot to a low simmer and stay on top of the stirring so nothing burns. No recipe modifications are required. Once you've made apple butter you can experiment with making other types of fruit butter. Whatever you are growing is likely to be a candidate. Think of pear butter, peach butter, apricot butter, and any other variety you may see at a farmers market or specialty store. You will save money and you have control over the ingredients.